My biggest concern coming to NIU was finding a community where I belonged. Growing up on military bases and later living in New York City, I didn’t know if I could find a similar, diverse community. Getting involved on campus really helped me feel at home here. I have a couple of jobs on campus, and I’m involved with different programs such as University Honors and Research Rookies. Because of these programs and the people I’ve met, I’m feeling great about my decision to come here. I think students should come to NIU because there are many opportunities here to enhance their education. There are so many different classes available and the faculty and staff are always willing to help. 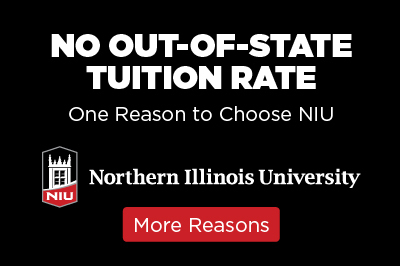 At NIU, it’s not just about academics; it’s about making an environment conducive to learning. In order to succeed in the classroom, you need to be supported, and I genuinely feel that at NIU. I love the fact that NIU is a large campus with a small campus feel. I thought that because NIU is large that I would be just a number. That definitely isn’t the case. Class sizes are small and professors make classes super enjoyable.